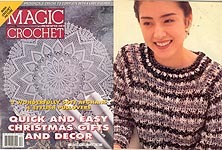 Magic Crochet is published by Les Editions De Saxe SA in France, with editions in English for the US and Canada. 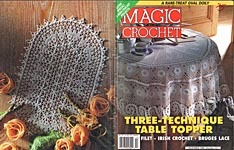 The magazines below are the English editions, but patterns do include "symbol crochet" as well as the more familiar crochet abbreviations. 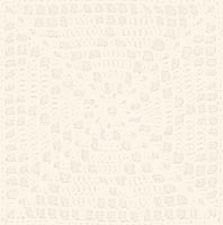 The majority of patterns seem to be thread crochet. Magic Crochet No. 88, Feb. 1994. 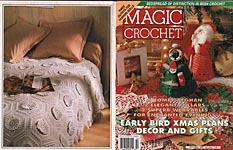 "Crochet For Home Decor": THE NEW TRADITION -- Coveted Coverlet, Over There, Pale Plum, Sundial; IRISH CROCHET -- Butterfly Collection, Gazebo; APPLIQUES -- Kitten in the Garden, Sweet Peas; MOTIFS THAT MATTER -- Ups and Downs of Stitches, Joining Patchwork Motifs; FILET GOES PICTORIAL -- Bowl of Tulips, The Last Supper, Heart- To- Heart Talk, Fair Pair, Chalice, A Den of Your Own, Land of Smiles, Country Hutch, Cafe Curtain, Quartet of Roses; PATCHWORK -- Milky Way, Dogwood Blossoms, Tutti- Frutti, Siesta, Chronicle, Delta, Frangipani, Floral Carpet; FASHION CROCHET -- Marian, Vivian, Lucky Stars, Filmstrip of How- Tos FrouFrou. Cover may be worn, but pages seem to be in very good condition. Magic Crochet No. 89, Apr. 1994. "Multi- Hued Crochet": SWEET CROCHET --- Royal Swan candy holder; PATCHWORK IN COLOR -- Flower Patch, Viola Crown, Patch of Posies, Pinks; FILET FANTASIA -- Jewel, Mural Bouquet, Climbers, The Good Earth, Ripening; MOTIFS THAT MATTER -- Where Motifs Come Together, Change Colors - Watch Designs; TIMELESS PATCHWORK -- Andalusia, Siciliana, Epicure; COUNTRY CROCHET -- Give Me A Home, Bide a While, Tea or Coffee, Arcadia, Pretty Gable; COLOR CROCHET -- Mahogany, Calypso, High Noon, Rose of Provence, Fiery Flame, Dress Circle, Mountain Laurel; IT'S IN THE BAG -- Velvet Beauty, Makeup Kits, Geranium Tote Bag; FASHION CROCHET -- Planets, Granny Glamour, Pioneer Spirit. May have scar on cover from tag removal, but otherwise very good used condition. 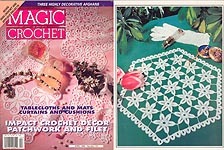 Magic Crochet No. 90, June 1994. 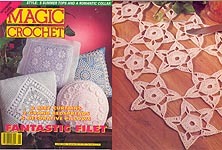 "Fantastic Filet": FILET CROCHET -- Land of Summer, Lilies, Piano Lesson, Fortuna, Netful of Butterflies, A Dream in White, Four Hearts, Tea Tray, Folk Art, Window Roses; MOTIFS THAT MATTER -- Circular Motifs Using Chain Loops, Corchet and Beads: FINE ART CROCHET -- New Port, Megastar, Lace Shade, Crustals, Town 'n' Country Square and Placemat, Round Cushion, Iner Circle, Azure, Engraving, Pebbles, Strawflower, Crocus Crown; PATCHWORK -- Tip- Top Topper, Nantucket, Anemonies, Light Snack, Floral Afghan, Four Seasons, Victorian Collar. 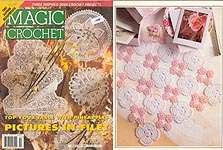 FASHION CROCHET -- Floral Checkers, Daisies, young Mood, Fit for a Queen, Black Lace, Alice. Very good condition. Magic Crochet No. 91, Aug. 1994. 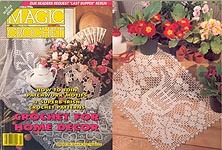 "Small and Easy Doilies": FINE ART CROCHET -- Jamboree, Beaming, Dawn, Scotch Thistle, Early Harvest, Aster, Milady, Magic Circle, Zoom on Bloom, Ripeness, Citron, Primorse, Barley, Gay Paree; MOTIFS THAT MATTER -- Flowers and Leaves in Irish Style crochet, Patchwork Makes a Fashion Statement; IRISH CROCHET -- Summer Cottage, Camellias, Amethyst; FILET CROCHET -- Dutch Date, Charleston, Martha's Fineyard, Early Morning, Chesapeake Bay, The Message, Quadrillle, Curtain Border, Golden Roses, Twin Daisies; PATCHWORK -- Mirage, Lunch Is Ready; FASHION CROCHET -- Think Pink, Night 'n' Day, Sweetie. May have \shelf wear to cover; pages in very good condition. Magic Crochet No. 92, Oct. 1994. 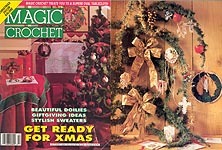 "Get Ready for XMAS" issue: XMAS IS COMING -- Candle Wreath, Tiny Trims, Snowflakes, Stars, Candleholders, Poinsettia, Pair of Reindeer, Table Topper; MOTIFS THAT MATTER -- Pearls Pure and Simple, The Colors of Yarn, The Colors of Wool; PATCHWORK -- Fit for a King, Lattic, Floral Trio; FILET -- Grand Party, Big Day, Criss- Cross, Those Closest, Littlest Angel; FINE ART CROCHET -- Memento, Tulips, Old French, Lounge, Cycle, Linkage, Magnolia, Old South, Big Wheel, Entwined, Waltzing Matilda Fashion Doll Gown; FASHION CROCHET -- Sun Valley, Chic Shells, Tomboy The French Look. Very good used condition. Magic Crochet No. 93, Dec. 1994. 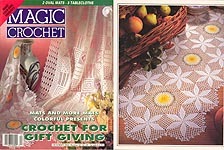 "Crochet for Gift Giving" issue: MOTIFS THAT MATTER -- Combine and Join Granny Squares, Work Half Squares in Rows, A Truly Personal Creation; PATCHWORK -- True or False, Tender Roses, Open Country, Table Topper, Cogwork; FILET -- Kaleidoscope, Tea Time, Hummingbird, Bluebells, Snowflake, Rambling Roses, Starstruck, Dogwood, Multicolor Mats, Gentians, Fragrance, Formal Lunch; FINE ART CROCHET -- Florentin, Anemone, Carnation, Oasis, Bull's Eye, Artistry, Golden Fruit, Passion Flower; QUICK CROCHET -- Belle of the Ball Fashion Doll Gown, Catch- All Basket; APPLIQUES -- Flower Baskets FASHION CROCHET -- Sweet Adeline, Polyanna, Year- Round Favoroite. Very good used condition. Magic Crochet No. 94, February 1995. FINE ART CROCHET -- Cypress, Stroke of Noon, Welmatted, Purity, Mignon Mini - Mats, Finesse, English Garden, Rosette, Lotus, Cactus Rose, Replica; FILET CROCHET -- Nesting, The Duck Family, Fruit Gbasket, Birds of Paradise, Reflection, Prime Time, Midday Snack, Four Corners, Cocoon, Coat of Arms, Heraldry; MOTIFS -- Remarkable Raised Effect, Edgings for a Finer Finish, Joining Motifs, Fine Points of Fastening Off, Edgins and Trimmimgs, Leaves and Flowers; PATCHWORK -- Floral Pillow, Legacy, Country Squares, Gossamer; DRESSING UP DOLLS --- Dancing Lesson and Edwardian Belle for 11-1/2" fashon dolls; FASHION FOR YOU -- Alice, Jennifer, Lavender. Very good condition. Magic Crochet No. 95, April 1995. "Springtime Decor" issue: PATCHWORK PROJECTS-- Shooting Stars, Spun Sugar, Good Morning, Pergola, Under the Stars, Cheryl's Choice, Springtime; MOTIFS THAT MATTER -- Popcorn: King of Dimensionals, The Art of Joining Motifs; FANCY FILET -- Oak Leaves, Fullblown Roses, Dreamland, Butterflies Alighting, Flower Show; FINE ART CROCHET -- High Society ensemble for 11-1/2" fashion doll, Sunflowers, Fondness, Paris Daisy, Spearmint, Solaris, Great Sheaf, Floreal, Arctic Circle, Close Circle, North Star, Falling Leaves, Running Feet, Waterlily, Blaze of Glory, Encore, Swirls; FASHION CROCHET -- Fish Scale Summer JAcket, Head Hugger, Happy Go Lucky, Knit 'n' Crochet Cardigan, Long Sleeve Bolero. Very good condition. Magic Crochet No. 96, June 1995. FILET CROCHET -- Dutch Couple, Lozenges, Shelf Lace, Octet, All in a Line, Oval Wonder, Lattice, A Rose is a Rose, Bella Vista, CHoice China, Sweethearts, Windmill; Stella, Decoy, Wallflowers, Sunday Treat, Blue Note, Fruit Bowlk Fresh Limve, Cynara, Edelweiss, Nutmeg, Weekend, An Apple a Day; PATCHWORK CROCHET -- Purses and Bags, Set For Parlor, Cafe Curtain, Chevrons, BLue Skies; IRISH CROCHET -- Behold the Flame; MOTIFS --- Floral Yoke, Exquisite Edgings; PRACTICAL CROCHET -- Hairpin Lace; FASHION CROCHET -- FLoral Vest, Samantha, Enchanted Evening, Collar Collection, Light as a Feather, Sunday Child. Very good condition. Magic Crochet No. 97, August 1995. 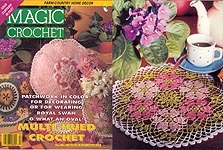 FILET CROCHET -- Twinds, Tete- a- tete, Bonjour, Pom Pom Roses, The Lord's Prayer, Bed fo Roses, Happy Years, Togetherness, White Mums, Fancy Miss, Four Leaf Clovers, Night and Day; PRACTICAL CROCHET -- Beginning the Chain, Trim and Edgings; FINE ART CROCHET -- Trellis, Curtain Call, Coronet, Cactus Flower, Tallgrass, Mountain Laurel, Scenario, Confetti, Blue Star, Blanche, Double Time, Opaline, Cherry Jubilee, Napa Valley; FASHION CROCHET -- Concert,Signorina ensemble for 11-1/2" fashion doll, Crochet Workshop SUmmer Cardigan, Luxury Cruise, Harlequin Cardigan, Good InVESTment. Very good condition. 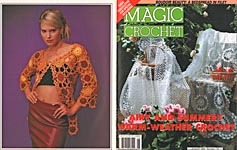 Magic Crochet No. 98, October 1995. CARRY ALONG PROJECT -- Creche Figures: Baby Jesus, Mary, 4 different Angels, Ox, Donkey, Joseph; FILET CROCHET -- Fancy Fans, Veranda, Midnight Ride, Garland, Roses in a Row; FINE ART CROCHET -- FIesta, Rosette,Old South, Kalinka,Dantiness, Bianca; NOSTALGIA -- Lady of Leisure, Lacy Parasol; PATCHWORK -- This and That, Gossamer Lightness, Cordoga, Tic Tac Toe, Fantasy, Flowering Dogwood, Kaleidoscope, Lace Afghan; IRISH CROCHET -- Cherry Blossoms, Ramblers; PRACTICAL CROCHET -- Poncho, Crochet Weaving; FASHION CROCHET -- Harmony in Blue, Checkerboard Vest, Stepping Out. Very good condition. Magic Crochet No. 99, December 1995. 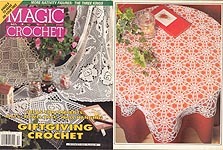 "Giftgiving Crochet" issue: FILET CROCHET-- Teatime, Hourglass, Intricate Play, A Friend is a Friend, Mystic Signs, New Arrival, Pair of Butterflies, Be My Valentine, Roses and Scrolls, Fine Fettle Whirl of Roses, Towel Lace, Queen of Flowers; FINE ART CROCHET -- Lillies of the Field, Cutouts, Simplicity, Cookie Treaat, Dolores, Eidelweiss, Birds of Wisdom; PATCHWORK -- Scatter Pillows, White Lotus, Flower Wheel, Dainty Diskettes, Optical Illusion, Out of Your Dereams; IRISH CROCHET -- Bathroom Dainties; CARRY ALONG PROJECTS -- Caspar, Melchior, Balthazar; CHRISTMAS CROCHET -- Four Little Angels; FASHION CROCHET -- Little Blossom, Fairest of Them All, Dressy Sweater, Victorian Collars. Excellent condition; still in dustcover. Magic Crochet No. 99, December 1995. 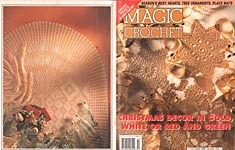 "Giftgiving Crochet" issue: FILET CROCHET-- Teatime, Hourglass, Intricate Play, A Friend is a Friend, Mystic Signs, New Arrival, Pair of Butterflies, Be My Valentine, Roses and Scrolls, Fine Fettle Whirl of Roses, Towel Lace, Queen of Flowers; FINE ART CROCHET -- Lillies of the Field, Cutouts, Simplicity, Cookie Treaat, Dolores, Eidelweiss, Birds of Wisdom; PATCHWORK -- Scatter Pillows, White Lotus, Flower Wheel, Dainty Diskettes, Optical Illusion, Out of Your Dereams; IRISH CROCHET -- Bathroom Dainties; CARRY ALONG PROJECTS -- Caspar, Melchior, Balthazar; CHRISTMAS CROCHET -- Four Little Angels; FASHION CROCHET -- Little Blossom, Fairest of Them All, Dressy Sweater, Victorian Collars. Several "dog eared" pages, but otherwise very good used condition. 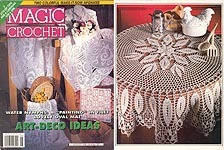 Magic Crochet No. 100, Feb. 1996. Designs include: Creche Accessory Figures -- Shepherd, Sheep, Pilgrim, Little Dog; DOILIES -- Newport, Daffodils in White, Virginia, Sunnyside, Florence, Lily in Bloom, Theme and Variation, Travels in Provence, Splendor; IRISH CROCHET -- Tender Trio Pillows, Rose Garden Doily, Dublin Doily, Shamrocks runner, Fairytale Princess picture; Country Comforts Pillows and edging for Throw, Happy Bride Set (edging, bag, and small carryalls), Calypso Pillow, Vis- A Vis placemat and coaster, Abstract Art, Lunch for Two mats & coasters, Pink Line runner, Bedroom Set (bedspread, pillow, catch- all), Trio Runner, Single Rose Runner, Foxglove Runner, Some Bunny Loves You Filet, Vest in Afghan Crochet, Peplum Slipon, Floral Bolero. May have writing on cover, but otherwise very good condition. Magic Crochet No. 101, Apr. 1996. 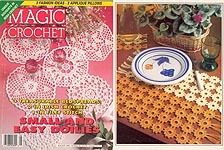 Designs include: DOILIES -- Floral Square, Septet, Sweet Sixteen, Quartet, Roses of Picardy, True Blue, Floral Hexagon, Stellar Puzzle, Intermezzo, Sunset Glow, Waterlily, Shasta Daisy, Pinecones in the Oval, Intricacy; Tall Trees Panels, Cabbage Roses Tablecloth, Summer Cottage Tablecloth, At A Glance Curtains; IRISH CROCHET -- Pictures at an Exhibition pictures, Spring Song mat, Octet Doily, Floral Medly Doily, Touch of Holly placemats, Butterfly Duo runner; AFGHANS -- Indian Summer, Spring Flowers, Four Leaf Clover; Flower Girls fashion doll dresses, Victorian Parlor (Armchair Cover, Square and round pillow covers, Summer Ahead girls blouse, Estival Festival Ladies's top, Vested Interest ladies' vest. Very good condition. 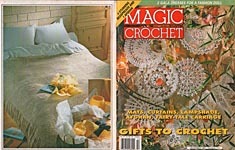 Magic Crochet No. 102, June 1996. 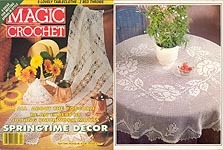 Designs include: DOILIES -- Gossamer, Tulips, Cartwheel, Wicker, Thistle, Rosette, Bit of Luck, To the Nines, Face to Face, Tender Duo, Nosegay, Double Square, Triple Treat, Round and Square; Unique View Curtain, Make Way Band, Good Fortune Tablecloth, Kind Hearts Runner, Anemones runner, Ruffles and Blossoms Tablecloth, Festive Armchair back and arm covers, Floral Carpet runner, Fixed Stars runner, Candy Pink Towel Edging, Towel Trim, Transparency Curtain, Sleepytime Bedspread, Sunny Cottage Afghan, Mint Sherbet Afghan, CRECHE FIGURE -- Wood Cutter with Knife Sharpener; Long Island ladies' top, Beach Comber ladies' coverup, High Life ladies' sweater (knit & crochet combined), Serena sweater (knit & crochet combined), On the Riviera top. Very good condition. 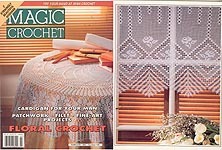 Magic Crochet No. 103, August 1996. Designs include: AFGHANS -- Queen's Ransom, Summer Flowers; CARRY ALONG CRECHE -- Spinner, Glory Be, Water Girl, Peasant in Sunday Best; FILET CROCHET -- Criss- Cross, Splashing Beauties Water Nymphs, Rosy Outlook, Romantic Journey; FINE ART CROCHET -- Dixie, Antique, Clementine, Morning Star, Play On, Sunday Best, Tulip Bouquet, White Dogwood, Tiny Thistles, Tulips, Coming Together, Floppy Star; PATCHWORK -- White Lilac, Seven Patch, Nine Patch, Four Patch, Star Twirl, Oval Marvel, Siesta, Your Turn, Daisies, Towel Lace; FASHION CROCHET -- Summer Evening, Virtuoso, Knit- and- Crochet Vest, Rosebud. May have label on cover; otherwise, very good condition. Magic Crochet No. 103, August 1996. Designs include: AFGHANS -- Queen's Ransom, Summer Flowers; CARRY ALONG CRECHE -- Spinner, Glory Be, Water Girl, Peasant in Sunday Best; FILET CROCHET -- Criss- Cross, Splashing Beauties Water Nymphs, Rosy Outlook, Romantic Journey; FINE ART CROCHET -- Dixie, Antique, Clementine, Morning Star, Play On, Sunday Best, Tulip Bouquet, White Dogwood, Tiny Thistles, Tulips, Coming Together, Floppy Star; PATCHWORK -- White Lilac, Seven Patch, Nine Patch, Four Patch, Star Twirl, Oval Marvel, Siesta, Your Turn, Daisies, Towel Lace; FASHION CROCHET -- Summer Evening, Virtuoso, Knit- and- Crochet Vest, Rusebud. Back cover, last few pages wavy at top as if something damp had been laid on the magazine. Otherwise, very good condition. 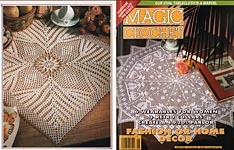 Magic Crochet No. 104, Oct. 1996. 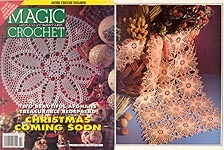 "Christmas Coming Soon": Designs include: DECOR CROCHET -- Passion Flower, Shasta Daisy, Nosegay, Allegro, Christmas Cheer, Egg Warmers, Stars and Booties, Opera Night, Forsty and Wreath; CARRY ALONG CRECHE FIGURES -- Miller, Farmer's Wife; PATCHWORK -- Lacy Clover, Rich Lace, Towel Trim, Toccata, Nature Bound, Fiesta, Cavatina, Good Morning, Double Feature, Rondo; FINE ART CROCHET -- Halcyon Days, Morning Call, Clear Day, Twilight, Intimate Circle, Lady's Lunch, Ferns, Ripples; FILET CROCHET -- Roses and Irises, Prairie Floers, Diamonds, Top of the Morning; AFGHANS -- Rhapsody in Rose, Patio; FASHION CROCHET -- On the Road, Alicia, Diamond Vest. Mauy have writing on cover; otherwise, very good condition. 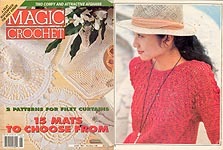 Magic Crochet No. 105, Dec. 1996. "Quick and Easy Christmas Gifts and Decor": Designs include: DECOR CROCHET -- Merry Christmas; CARRY ALONG CRECHE FIGURES -- Elegant Lady, Fisherman, Flower Girl, Flower Vendor; FILET CROCHET -- WHat Happened, Morningside, Perfectly Clear, Grenadine; FINE ART CROCHET -- Variety, Small Detail, Open Orchid, Wheat Harvest, Ritzy Ruffles, Heavenly Spheres, Good Neighbors, Autumn Song, Pretty Puffball, Impatiens; PATCHWORK -- Nosegays; AFGHANS -- Ripples in the Wind, Raspberry Sherbet; FASHION CROCHET -- Raglan in Chine, Raglan True Blue, Raglan Cardigan, Samantha. May have label on cover; otherwise, very good condition. 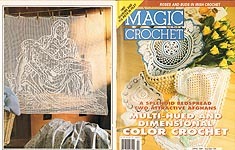 Magic Crochet No. 106, Feb. 1997. Designs include: FINE ART CROCHET -- Turning Point, Make a Splash, Tender Thought, Wood Anemone, Purple Posies, Curtain Tie 'n' Lace, Windmill, Octet, Morning Blush; IRISH CROCHET -- Flowers Grwoing, Autumn Gentians, SNowbells; PATCHWORK -- Cascade, Taormina, Jonquils, Big Blossoms; FILET CROCHET -- Bass Clef, Hummingbirds, Heart's - Ease, Optimal Oval, Antique Curtain; AFGHANS -- Town and Country, Martha's Vineyard; FASHION CROCHET -- Flowers and Diamonds, Cardigan for Your Man, Woman's Raglan Cardigan. May have label on cover, but otherwise very good condition. Magic Crochet No. 106, Feb. 1997. 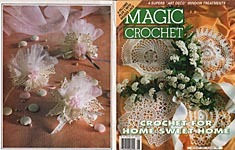 Designs include: FINE ART CROCHET -- Turning Point, Make a Splash, Tender Thought, Wood Anemone, Purple Posies, Curtain Tie 'n' Lace, Windmill, Octet, Morning Blush; IRISH CROCHET -- Flowers Grwoing, Autumn Gentians, SNowbells; PATCHWORK -- Cascade, Taormina, Jonquils, Big Blossoms; FILET CROCHET -- Bass Clef, Hummingbirds, Heart's - Ease, Optimal Oval, Antique Curtain; AFGHANS -- Town and Country, Martha's Vineyard; FASHION CROCHET -- Flowers and Diamonds, Cardigan for Your Man, Woman's Raglan Cardigan. Excellent condition, but may smell MUSTY. Magic Crochet No. 107, Apr. 1997. Designs include: FINE ART CROCHET -- Blue Note, Forget- Me- Nots, Luncheon Set, Sugar 'n' Spice, Sunburst; IRISH CROCHET -- Yellow Roses, Rosebuds, Rose Garden; PATCHWORK -- Garlands, Dogwood Blossoms, Winter Flowers, Morning Hour, Sleepy Time, Floral Splash; AFGHANS-- Choice Plum, Down To Basics; FILET CROCHET -- Peacock, Lovebirds, Floral Duet, Cherub, Bambion, Stem Roses, Pieta; FASHION CROCHET -- Lace Top, Floral Raglan. Excellent condition. Magic Crochet No. 109, August 1997. 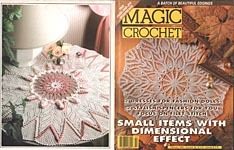 FINE ART CROCHET -- White Lilac, White China, Cross of Distinction, Passion Flower, Beaded Beauty, Upsy- Daisy, Close Circle, Pleasant Surprise, Fans and Roses, Morning Hour, VIP Mat, Fourfold Square, Sonnet, Labyrinth; BRUGES LACE -- Scatter Pillows, Summer Garden; FILET CROCHET -- Filet Stitch in Review, Exotic Blomes, Tasseled Curtains, Whitework; PATCHWORK -- Table Topper, Sleeping Beauty, Dogwood Blossoms, Wheels A- Turning; FASHION CROCHET -- Prim and Pretty, Page Collar, Stepping Out for 11- 1/2" fashion doll. May have label on cover; otherwise, very good used condition. Magic Crochet No. 110, October 1997. IRISH CROCHET -- Christmas Cards, Field of Daisies, Holly Berries; FINE ART CROCHET -- Xmas Tree, Santa Claus, Indian Summer, Autumn Song, Honeymoon, Making Waves; FILET CROCHET -- Warm Welcome, Ramblers, Sampler, Mary's Lamb; PATCHWORK -- Optical Illusion, Maid of Honor, State Flower, Charade, Four O' Clock, Planets; AFGHAN -- Cottage Blues; FASHION CROCHET -- Very Important Vest, Morning Dove Jacket, Pineapple Collar; DRESSING FASHION DOLLS -- Chic Dolly, If You Knew Suzy, Monica. May have label on cover; otherwise, very good used condition. Magic Crochet No. 111, December 1997. FILET CROCHET -- Sonata, Roses Aglow, In the Vineyard, Fresh Start, Take to Heart, Square Dance, Friendly Spider; PATCHWORK -- Dreams Definied, Checkerboard, Gardenia, Field of Flowers, Rancho Grande; AFGHAN -- Stripe on Stripe; FINE ARTS CROCHET -- Knit 'n' Crochet, Cherokee Rose, Wood Anemone, English Daisy, Sweet William, White Carnation, Peaches 'n' Cream; SPECIAL GIFTS -- Belle of the Ball, Royal Wedding, Gala Evening ensemble for 11-1/2" fashion doll; FASHION CROCHET -- Matron of Honor, Zigzag Top, Party Time.Very good used condition. Magic Crochet No. 112, Feb. 1998. 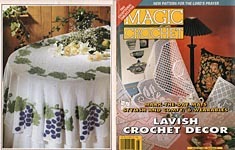 Designs include: FILET CROCHET -- Grape Clusters, Best Friend, Fruit Basket, Turtle Doves, Rising Moons, Peace Doves, Jonquil Placemats, Rose Garden, Sweet Violets, A Rose is a Rose; CRAFTS -- Patch Tree; HOME DECOR -- Flower Bouquet; FINE ART CROCHET -- Star Flowers, Slip- On Coasters, Pasque Flower, Coriander, Dogwood Blossom, Azalea, Homey Hexagon; PATCHWORK -- Mantilla, Private Time. Botanical Bounty, Pale Roses, Midday Runner; FASHION CROCHET -- Lace Cardigan, Daisy Chain Tunic. Very good used condition. Magic Crochet No. 113, April 1998. IRISH CROCHET - Lily Pond; PATCHWORK -- Private Area, South Seas, Floral Diamond, Septet, Master Bedroom, Heliotropes, Antique Tiles, Azores, Square Deal, Blooms Aplenty; FINE ART CROCHET -- Pineapple Parfait, Lady's Hankie, Sundials, Whirligig, Cushy Pair, Sextet; FILET CROCHET -- On the WIng, Four Peonies; GREAT GIFTS -- Egg Warmers, High- Rise, Display Basket, Sun Worshiper, Grand Party outfit for 11-1/2" fashion doll; FASHION CROCHET -- Lacy Vest, Top 'n' Cap for Girl. Very good used condition. Magic Crochet No. 114, June 1998. FINE ART CROCHET -- In the Swing, Opaline, Charleston, Pineapple Crown, Front Porch, Sheer Oval, Cayenne, Strawflower; FILET CROCHET -- Morning Glories, Peace and Quiet, White Diamonds, Twin Roses, Narcissus, Magic Castle; PATCHWORK -- Little Treasure; IRISH CROCHET -- Little Rose, Bedtime, Prize Tassels; FASHION CROCHET -- English Princess for 11-1/2" fashion doll, Crochet Jewelry, Beaded Collar, Vanilla Meringue Lovely Lucy, Garden of Eden. Very good used condition. Magic Crochet No. 115, August 1998. 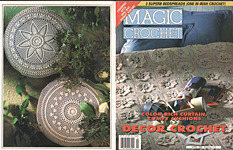 PATCHWORK -- Floating Islands, Tocatta, Meadow Walk, Cherry Blossoms, Clematis, Narcissus, New World, Down the Avenue, Sheer Delight; FINE ART CROCHET -- Box Cover, Face the Day, Oak Leaves, Early Morning, Italian Cuisine, Two- Tone Trio, Victorian Splendor, Lilies of the Valley; FILET CROCHET -- Stately Mansion, Bedroom Mosaic, Tulip Time, Lovebirds, Swallowtail Butterfly, Day Off, Cottage Curtain, Curtain Panels; FASHION CROCHET -- Short- Sleeve Cardigan, Carioca. Very good used condition. Magic Crochet No. 116, October 1998. 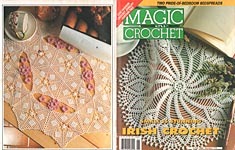 IRISH CROCHET -- Songbird in a Bush, Lace Hanky, Victorian Heart, Tasseled Balls, Holiday Place Mats, Green Stars, Egg Warmers, Goodies Bag; FINE ART CROCHET -- Open Hearts, Picture This, Festive Place Mats, Golden Nugget, Glitterati Special, All that Glitters, Golden Vision, Snowflakes, Colorful Lace, Deluxe Tiebacks,Pineapples in Prime ; PATCHWORK -- Timeout, Campions, Happy Day, Table Skirt, Teatime; ORIGINAL GIFTS -- Pretty Pouch, Potpourri Cup; FASHION CROCHET -- Party Dress an dDress Jacket. May have name or label on cover; otherwise, very good used condition. 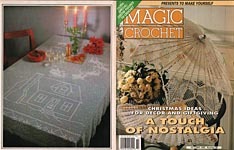 Magic Crochet No. 117, December 1998. IRISH CROCHET -- Periwinkle, Precious Collar, It's the Top, Daisies, Fresh Start; FINE ART CROCHET -- Gourmet's delight, Pure Joy, Excellence, Little Blossoms, Blue Note, Pasta to Perfection, Little Pillow, Two of a Kind, Fortune Cookies, Writing Desk; FILET CROCHET -- Tulips Entqined, Table Topper, Greek Placemat; GIFT GIVING CROCHET -- Sachets; PATCHWORK -- Dance of the Flowers, Company Coming, Dreamland; FASHION CROCHET -- Lace Tunic, Coming up Roses. May have writing or label on cover; otherwise, very good used condition.